This month, I spent a couple weeks in Europe, building our business through partnerships with resellers in a market that needs powerful, user-friendly CRM and marketing automation as their economies modernize. One segment of my trip took me from Prague, Czech Republic to Krakow, Poland, and I was amazed by the experience. 50 Euros (about $65) took me in a premium roomy cabin with lots of legroom (when you're 6'4", leg room is always an issue), leather seats, and a friendly attendant who brings you drinks and/or breakfast. The train cruised through the Czech countryside at 100 mph, smooth as silk over the rails. It reminded me of a case study about Southwest Airlines I read when I got my MBA. Back then (WAY back then), Southwest was a growing airline, still trying to gain footholds in new markets, but their culture was different. The case study focused on that culture and how customer experience makes you think about competition in a different light. Herb Kelleher, the CEO at the time, became famous for driving culture that strived to make the company look at competition in a bigger context than just "are we better than another airline". Southwest wasn't competing with American, United, Continental, and the other airlines. Southwest was competing with every mode of transportation that someone could use to get from Point A to Point B. In other words, when you provide a product or a service, you don't have to be just better than someone else in that particular industry. You have to be better than the customer's other choices to solve a problem. Thinking about the challenge of growing your business this way will make things harder for you. No matter how hard Southwest tries to make flying fun, you still have to deal with TSA when you arrive at the airport. And that makes travelers think about whether the hassle is worth even flying at all. Maybe it's easier to drive or take a train. Getting on this train through eastern Europe was a far better travel experience than I have ever had flying commercially. It was easy to board the train, I had plenty of room, the attendants on the train were friendly people, and overall the entire journey was very smooth. I could have made the same journey flying, but it would have cost at least three times as much and between metal detectors, X-ray machines, terrible food, weather delays, tiny airplane seats, lost luggage, and a thousand other things we've all experienced, the train ended up the far superior choice. Which brings me to GreenRope, and how customer experience is something we put first and foremost. We have all had good and bad experiences as customers. It is my personal goal to make every customer as happy as possible, providing they are legitimate businesspeople (e.g., not spammers) and treat our team with respect. This positive customer experience starts the moment someone contacts us, interested in learning how our CRM and marketing automation software can help their organization. We use our own ticketing system (under Apps > Ticketing, if you're a GreenRope user) to capture interest in getting a demo and a trial account. This makes sure we respond quickly, tracks any questions in the investigation of our platform, and of course stores everything in our CRM. We use GreenRope every day to manage our own sales and marketing because we know how important it is for us to be responsive and timely. One important part of the customer experience is actually interacting with our software. Here's the part where I open up and admit one of my own personal weaknesses - I built many parts of the first versions of GreenRope, and I am not the world's best designer. I am an engineer, and I think like an engineer. While I try as hard as I can to think like a marketer and a salesperson, that's not my primary focus. To make matters worse, I am a terrible artist. Like just barely above stick figures. One thing I didn't have the fortune to inherit from my Mom. Early on, when you start a business, especially as a company without investment funding, you have to make difficult choices on where to spend precious resources. We couldn't afford the UI/UX designer we needed, so we did the best we could with what we had. The results speak for themselves, especially when you read earlier reviews of GreenRope. It is a powerful system, but not as pretty as users would like. Fortunately, we found clients who were willing to invest in GreenRope despite its overly techy-looking interface. With that we were able to hire some great designers, and have been investing significant effort in improving the user interface and workflow. These new improvements are happening continually, and if you're a regular user of GreenRope, you are seeing the transformation happen monthly. In recent months, we have released our new compact interface design, new flat buttons, a consistent color scheme, and just last week, our new Action flyout button. Each of these was the result of collaboration between our customers, our creative design team, our marketing team, our salespeople, our support staff, and our managers. Each release has been met by our users thanking us for making these strides toward building a more intuitive, easy-on-the-eyes platform. This is important on a grander scale than just using software. We know that CRM and marketing are big parts of a business, and sometimes involve complex projects with many people interacting together. Managers and users alike have choices to make. If it's easier to use a spreadsheet and still "get by", people will do it. We have to make sure we're not just better than other CRMs. We have to be better than the easiest way people can think of to manage their sales, marketing, events, and customer service functions. Looking at our to-do list, we know we will never be "done". At no point will we sit back and say, "There, GreenRope is 100% built and does everything it will ever do". Concepts of modern design will change. Technology will change. We will continue to innovate and bring new kinds of knowledge, insight, and automation to our users. Every day we strive to improve our customer experience because that is what creates our identity. The better we serve you, the happier you will be, and I'll be honest - I take every complaint and compliment personally, whether or not someone says I shouldn't. We are driven by feedback from our customers. 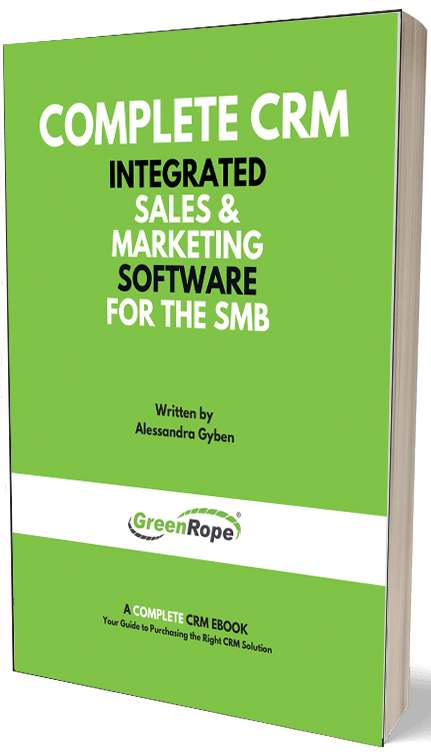 As a GreenRope user, you have the ability to drive the direction of the software. Listening is what has built the most powerful CRM and marketing automation system on the planet, and our culture is built around this collaboration. We talk about every piece of feedback we get and take all of it seriously (except for the request to provide human-implantable scanners - we'll wait for Borg invasion on that one). For those of you who are reading this and have made these contributions of feedback, thank you. Keep it coming. It makes our day when you share your thoughts, feelings, and ideas. Together we can build something even better than we have today, and I look forward to the challenge to provide the best customer experience on Earth.